This document is part of a series of airhead electrical system documents. You can find the others here. This document describes the various electrical components used in the 5 Series and summarizes how they work. I include a number of references in the Resources section containing much more detail about how the 5 Series components work and the differences compared to later airhead series. 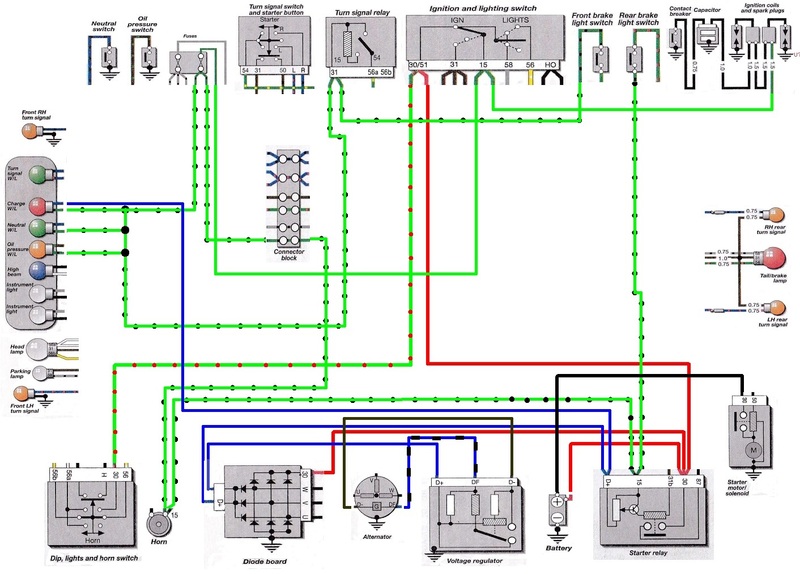 Here is a Haynes Manual wiring diagram with the wires removed showing all the major components. Some of these major components include other components such as resistors, capacitors, relays and transistors. It’s easier to follow along if you click the picture above to enlarge it. If your mouse has a scroll wheel, pressing CTRL and spinning the scroll wheel will smoothly magnify-shrink the image. Here is a list of resources I used to help me prepare this material. As a convention, I use BOLD CAPITAL LETTERS to indicate a solid wire color and use the same color for the letters. If the wire has a stripe, I use an Initial capital letter for the stripe color with the letters the same color as the strip, e.g., RED, GREEN–Red. Links to sections in this and other documents are shown with Blue Bold Underline. These components are basic devices used in almost all electronic systems. The 5 series electrical system includes all of them, often embedded in major components such as the starter relay, diode board, voltage regulator, etc. A capacitor stores electrical charge. When you connect it’s two terminals to a battery, assuming the capacitor has no stored charge inside it, current will flow from the battery for a short period of time until the voltage between the two capacitor terminals have the same value as the battery which is typically 12.6 volts for an Airhead lead-acid battery. When the current stops flowing, the capacitor is considered to be “charged”. If you disconnect the battery, the capacitor will maintain the 12.6 volts of charge stored until it is discharged by connecting it’s two leads to an electrical resistance. When you do this, the stored electrical charge flows from the (+) side of the capacitor, through the resistance to the (-) side of the capacitor until all the stored charge is dissipated by the resistance into heat. Note that any wires or other electrical components that are connected to the capacitor’s two terminals will have a resistance. Since a battery has a (+) and (-) terminal, when you hook the capacitor terminals to the battery, the capacitor terminal connected to the (+) battery terminal will become positive and the other capacitor terminal will become negative. Since it takes some time to charge the capacitor, the change in voltage of the capacitor is not instantaneous as it would be if you closed a switch between the two battery terminals. There are many situations where having voltage build up slowly is desired and a capacitor is used to do that. If you now connect the two capacitor leads to a light bulb, current will flow out of the capacitor and through the bulb, but not continuously as happens when you connect the bulb to the battery. All the charge flows out of the capacitor in a short time (likely less than a second) until all the charge stored in the capacitor has flowed through the bulb filament. When there is no charge stored in a capacitor, it is considered to be “discharged”. As with charging, discharging is not instantaneous. There are situations when you want to send current somewhere, but not all at once in an instantaneous rush, and then have the current flow stop. A battery will continue to send current, but a capacitor won’t so it is used in this situation. 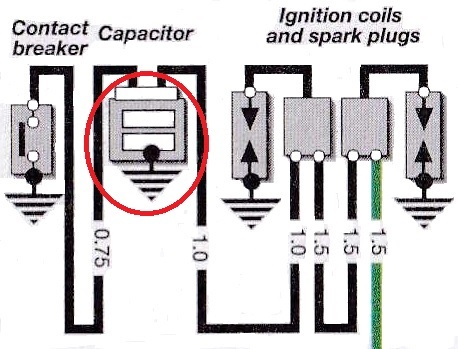 As shown in the diagram below, a capacitor is part of the engine ignition system, which is described elsewhere in this document. Any wire with a current flowing though it develops a circular magnetic field around the wire. The direction of the magnetic field is defined by the direction of the current flow in the wire and is at right angles to the direction of the current flow. For a coil of wire, the magnetic field created has it’s “N”orth and “S”outh poles at opposite ends of the coil, so the field resembles the one you get with a bar magnet. Coils are versatile electromagnetic devices. Electric current flowing in a coil creates a magnetic field and a moving magnetic field passing by a coil will induce, or create, a current flow in the coil. Interacting magnetic fields in two coils create a force that can move one of the coils if it is free to move, such as if it is attached to a shaft that is free to rotate. Coils can be used in various ways. A coil with current flowing through it generates a magnetic field that moves a metal strip to bridge two electric terminals letting current flow between them. 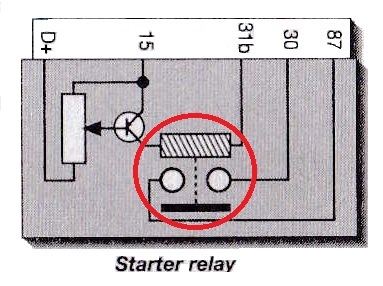 This is how relays, such as the starter relay, work. A current flow in a coil is created by moving the coil through a stationary magnetic field. This configuration is not used in the 5 Series electrical system, but is used in some after market alternators that replace the Bosch alternator. A stationary coil magnetic field (created by current flowing through it) interacts with a second coils magnetic field to create a force on it. The second coil is attached to a shaft and the force on it establishes a torque that rotates the second coil and its shaft. This is used in the starter motor to start the engine. A changing current flow in one coil can induce a current flow in a coil near it (or inside it). This is used in the ignition coils. A coil of wire the same length as a straight piece of wire will generate a stronger magnetic field than the straight wire. The more coils of wire the stronger the magnetic field of the coil compared to the straight piece of wire. However, the effect of changes in current flow through the straight wire are different than through a coil of wire. The coil configuration slows the change in current flow through it compared to the straight piece of wire. Consider the simple battery, switch, bulb circuit below. When the switch closes, the current flow through the bulb rises to it’s maximum almost immediately. The value of the current flow is defined by Ohm’s law, E = I x R, or rearranged, I = E / R, where “E” is the voltage, “I” is the current in amps and “R” is the resistance in ohms. If the battery provides 12.6 volts, and the resistance of the bulb’s filament is 4 Ohms, then the current flow through the circuit is about 3.1 amps through the circuit. 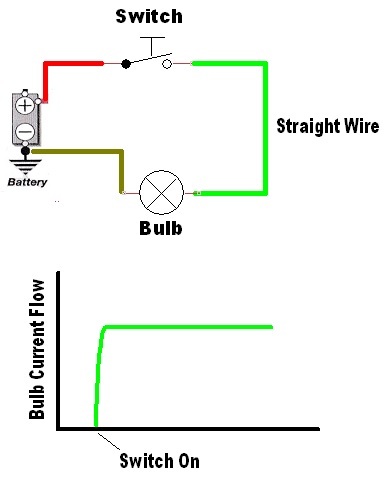 Consider the same circuit with a coil connected between the switch and the bulb. Assume the length of wire used in the coil is the same as the length of the straight wire in the previous diagram, it’s just been reconfigured into a series of coils. 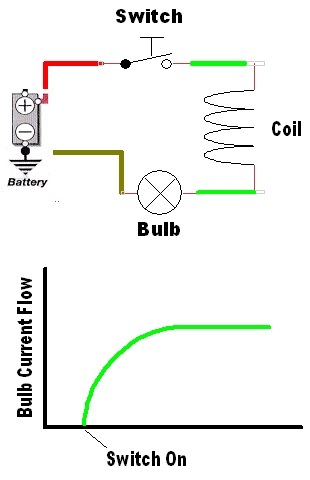 As shown in the diagram below, when the switch closes, current from the battery (GREEN arrow) starts flowing through the coil of wire. This creates a growing magnetic field with its associated magnetic field and flux around the coil with the “N”orth pole of the magnetic field pointing to the right. But, when a changing current moves through a coil of wire, the changing magnetic flux induces an electric current in the OPPOSITE direction to the in-flowing current that is proportional to how fast the magnetic flux is changing. This is indicated by the BLACK arrow. 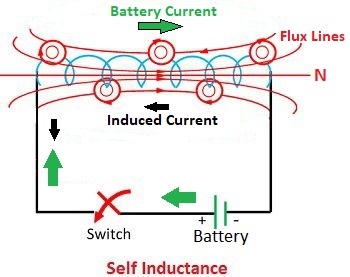 The induced current is smaller than the in-flowing current as indicated by the smaller size of the BLACK arrow. When current first starts flowing through the coil from the battery, the magnetic flux is changing quickly so the induced current flow in the coil is larger than when the magnetic flux is almost at it’s maximum. Therefore, the time it takes to reach full current flow of 3.1 amps through this circuit is longer than it takes for a straight wire of the same length due to the opposing induced current flow. When the magnetic field reaches it’s maximum, the magnetic flux stops changing so the induced current flow in the coil becomes zero. At that point, the current flow through the coil is a constant 3.1 amps, the same as for the straight wire, and the coil continues to act just like the straight wire. By analogy, this is like two streams of water running into each other, one stronger than the other. The rate of flow is still in the direction of the stronger stream, but the net flow is reduced. As the flow of the weaker stream decreases and finally stops, the net rate of flow increases until it is the same as the original stronger stream. The visual effect when there is a coil in the circuit is the bulb gradually brightens rather than instantaneously turns on. In this example, how slowly the bulb brightens depends on the number of turns of wire which defines how much electrical energy from the current flow will be stored as magnetic energy in the coil. If you wrapped the wire around a steel bolt, the magnetic flux becomes stronger as both the electrons in the wire and bolt are contributing to the magnetic flux. With the steel bolt configuration, it will take even longer for the bulb to brighten since the fixed current flow in the wire is used to store a larger magnetic field. 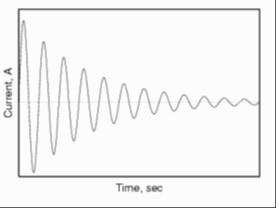 A similar behavior happens when the current flow to a coil is stopped. When you open the switch, the current flow through the coil does not instantly drop to zero as it would in a straight wire the same length as the coil of wire. As the magnetic field starts to diminish (referred to as “field collapse”), the magnetic flux is changing, but in the opposite direction compared to when current starts flowing through the coil. This reversed direction of the magnetic flux change induces a current flow in the coil in the SAME direction as the current flow from the battery so the net current flow through the coil decreases slower than it would in a straight piece of wire of the same length. Said differently, the magnetic energy stored in the coil’s magnetic field has to convert back into electrical energy and that increases the time for the current flow through the coil to come to a stop. So when the current starts flowing through a coil, the induced current flow opposes the flow from the battery due to the direction the magnetic flux is changing, i.e,.it’s expanding. But a collapsing magnetic field reverses the direction of the changing magnetic flux so the induced current through the coil goes in the opposite direction, so it is now flowing in the same direction as current from the battery would. To summarize, a coil can be used to slow the rate of change of current flow through a circuit as it stores, or releases, the energy in the coil’s magnetic field. But, when there is no change in current flow, the coil acts just like a straight piece wire of the same length and diameter. It now behaves like a small, pure resistance with the same resistance as a straight piece of wire the same length. When coils are made, the windings can’t touch each other or they will short out and you don’t have a coil any more. To make a compact coil, you want to tightly wind the wire so you get the maximum magnetic field for a given amount of wire. Therefore, insulation is used on the wire so the individual coils can touch each other but remain insulated from each other. It is common to use a varnish or shellac as the insulator. Also, if a piece of steel is placed inside a coil, the strength of its magnetic field is greatly increased. It’s common for coils to have steel rods or stacked steel plates inside the coil so less wire is needed to create a given strength magnetic field. When a changing magnetic field moves past a stationary coil of wire, it induces a current flow in the coil. Or, if you move a coil of wire through a stationary magnetic field, you also induce a current flow in the coil of wire. It doesn’t matter if the field moves past the stationary coil, or a moving coil passes through a stationary magnetic field. In either case, an electric current is induced in the the coil of wire. The direction of the current flow is defined by the direction the magnetic field moves past coil of wire. The quantity of induced current flow depends on the relative velocity and the number of coils of wire. I said “current flow” through the coil of wire. But if the two ends of the coil are not connected to anything, then NO current will flow through the wire since there is no closed path between the (+) and (-) battery terminals, aka, its an open circuit. That said, there is still an induced voltage in the coil. If that voltage gets high enough, it can jump the air gap between coils of wire, or overcome the insulation layer on the wire, and create a spark. When a spark breaks through the insulation repeatedly, the insulation will fail and the adjacent coils will touch and short out. In 5 Series bikes, this happens if you remove the spark plugs from an engine and don’t ground them when you crank the engine over. The induced voltage in the secondary windings of the ignition coil is high enough to break through the varnish insulation and arc across the windings. This damages the coil and can short out the windings causing it to fail. If you put a coil inside a magnetic field, and then pass a current through it, the magnetic field in the coil will interact with the static magnetic field surrounding it, as shown in the diagram below, to create a force on the wire. The direction of the force is defined by the direction of the fixed magnetic field (from left to right in the diagram below) and the direction current flows in the wire (back to front on the left side of the coil, and front to back on the right side of the coil). This interaction of the two magnetic fields results in a force on the parts of the coil that cut across the magnetic field (shown by the up and down arrows) that go in the opposite direction. The difference in the direction of the force on the left and right legs of the coil is caused the opposite directions of the current flow in the legs. There is no force on the top part of the coil since the current flow is parallel to the magnetic field. The opposing forces on the legs of the coil create a torque that turns the coil and the shaft it is connected to. When the legs of the coil rotate 90 degrees from the position shown, the opposing forces on the legs are in line so the torque is zero and the shaft stops turning. In reality, the shaft tries to spin a bit past where the forces are aligned due to its momentum, but the forces reverse direction since the current flows in the two legs have reversed direction so an opposite torque exists that turns the coil back to the position where the forces are aligned. Therefore, the coil becomes stationary and stops turning. It is possible to keep the shaft and coil turning in the same direction instead of stopping when the forces in the arms align. The trick is to reverse the current flow in each coil leg just when the legs rotate to the position of force alignment. The reversed current flow in each leg reverses the force so it is still pointing in the same direction in the left and right legs. The shaft can continue turning through 180 degrees until forces in the legs are once again aligned and once again you again reverse the current flow. This allows the coil and shaft to continue to turn as long as current is flowing through the coil. Another way to see how to keep a continuous torque on the coil to be sure the current always flows in the same direction in each side of the coil no matter which leg currently is on that side. Changing the direction the current flows through each leg of the coil is done with “split rings” on the shaft. The dc battery current flows through the split rings and always flows in the same direction through whichever leg is on the left and right sides of the coil. As the shaft rotates, each ring alternately connects to the (+) and (-) battery terminals at just the right time to generate a continuous torque on the shaft so it continues to spin. Rather than a permanent magnet being used to create the stationary field, you can use a second stationary coil with current flowing through it. This is the design used in the 5 Series starter motor which you can read more about elsewhere in this document. You can also spin a coil with a current flowing through it inside a stationary coil of wire. The spinning coil has a spinning magnetic field that will induce a current flow in the stationary coil. This is the “inverse” of a motor. Where a motor uses interacting magnetic fields in two coils to produce a mechanical force that continuously spins one of the coils, the “inverse motor” mechanically spins one of the coils and its magnetic field to produce electric current in the stationary coil. This is how the 5 Series ac alternator works. 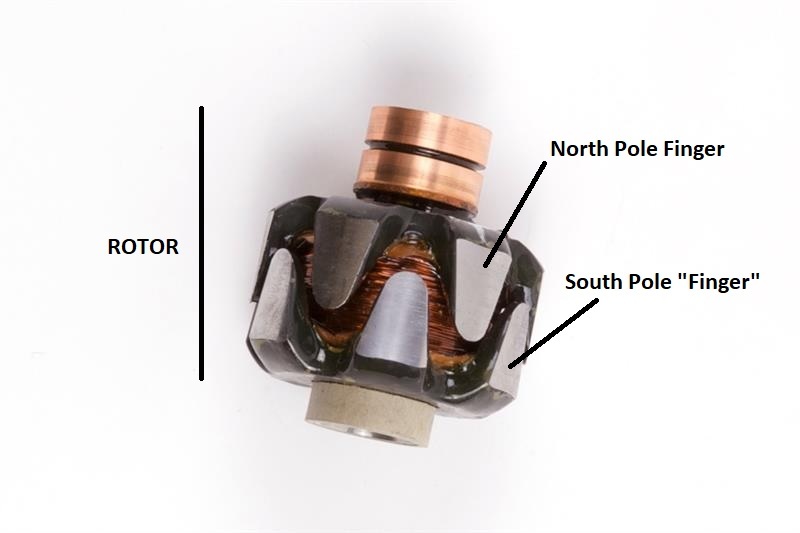 A magnetic field created in the alternator’s rotor coil is attached to the crankshaft that spins it inside a set of fixed coils, called the stator. This spinning magnetic field of the rotor coil induces an ac electric current flow in the fixed coils. See elsewhere in this document for a description of how the alternator works. It’s possible to configure two coils, one inside the other, so that a changing current flow in one coil creates a changing magnetic field that induces a current flow in the second coil. The induced voltage in the second coil can be different than the applied voltage in the first coil. If there are many more coils of wire in the second coil, the induced voltage will be greater. This effect is used in the ignition coil to generate a very high voltage in the secondary coil from a much lower voltage in the first, or primary coil. This is described in more detail in the Engine Ignition System section elsewhere in this document. Coils are used in various configurations in the engine ignition system coil, the starter motor and the starter solenoid, in the voltage regulator and in various relays. A diode lets electrical current only flow in one direction. It acts like a back flow preventor in a water line that only allows water to flow into your house, but not backwards out of your house into the water main. The symbol for a diode looks like this. The (+) side, or anode, is the end with an arrow head pointing in the direction conventional current flows through the diode. The (-), or cathode, is the end with a vertical bar symbolizing a closed door that blocks current flow from the (-) terminal. Sometimes, an airhead circuit that typically has electrical current flowing in a desired direction can experience a reverse flow, which is not wanted. In that case a diode is used to prevent the reverse current flow. AC current is constantly alternating. 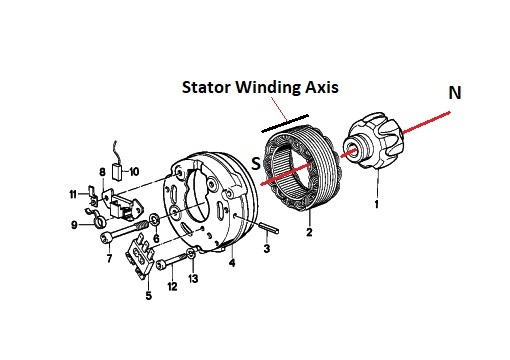 Therefore current flow through wires connected to ac current generating devices, such as the airhead alternator, first flow in one direction and then reverse to flow in the opposite direction. Since the battery is a dc device, it can not be charged if it is directly connected to the ac current flow generated by the alternator. A special configuration of diodes are used to not only to stop the reverse flow, but to invert the negative voltage to positive so all of the alternator output can flow in the proper direction to charge the battery. This is accomplished by the diode board which has a full-wave rectifier. 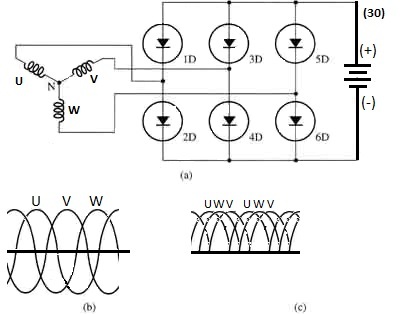 A full-wave rectifier uses is a specific configuration of several diodes to convert the negative ac current flow into positive flow. You can read about the diode board and the 5 Series full wave rectifier in the alternator section elsewhere in this document. A resistor resists current flow like a valve resists water flow. The voltage before the resistor will be more than the voltage after the resistor. This is similar to the behavior of water pressure before a valve which is higher than the pressure after the valve. Consequently, resistance reduces the energy of a current flow by converting the energy of the moving electrons into heat. That’s why a tail light bulb gets hot when it’s lit and coils and starter motors also get hot. Every conductor has some resistance, although it can be small, and all insulators have resistance, quite a lot, which is why they are insulators. In the case of wire, its resistance will increase as the length increases and as the diameter decreases. This is why wire that carries high current flows has a larger diameter than wire that carries smaller current flows to avoid heating the wire to the point it melts. However, in the case of a fuse, the wire diameter and length is chosen so that when the current flow reaches a certain value, the wire will heat enough to melt opening the circuit and stopping current flow. This protects other components downstream of the fuse from seeing too high a current flow. This is the reason fuses are placed close to the (+) battery terminal and ahead of other components so it will see the rising current sooner and can open before too much current flows through the down stream components. The 5 Series voltage regulator and starter relay have resistors inside. Transistors are made out of semiconductor materials like silicon or germanium. They can be used in two different ways: as an electrical switch turning current flow on or off, or as an amplifier increasing a small current flow to a much larger one. Transistors types are identified as NPN, the most common, or PNP. The “P” stands for positive and the “N” stands for negative. Therefore a NPN transistor is a sandwich of a negative semiconductor (surplus electrons so it is an electron donor) next to a positive semiconductor (a deficit of electrons so it is an electron “drain” or sink) followed by a negative semiconductor. The two negative semiconductors don’t have enough surplus electrons to allow current to flow between them unless the “P” semiconductor supplies some. The three terminals of a transistor are called emitter, base and collector. 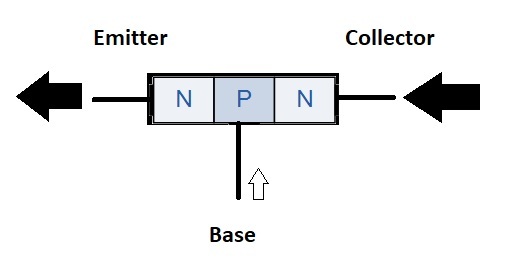 The NPN transistor arrangement is shown below. One of the “N” semiconductors is the emitter and the other is the collector. The middle terminal is called the base. The voltage difference between the base and emitter is designed so the base is more (+) than the emitter. The voltage difference between the emitter and the collector is designed so the collector is more (+) than the emitter. In this state, no current will flow from the collector to the emitter. But, if a small current flows into the “P” layer in the middle, it’s electron flow allows a larger current, usually much larger than the base current, to flow from the more (+) collector to the more (-) emitter as shown by the large black arrows. When the small current is turned off, the transistor won’t let any current flow between the end terminals. By adding and removing the small current to the middle semiconductor, it turns the transistor into a switch that operates just like a mechanical switch would. For an NPN transistor, the current flows into the middle layer, so there has to be a slightly higher voltage on that lead than at the collector. The voltage difference required at the middle layer compared to the voltage of the collector (NPN) is 0.7 volts. For a PNP transistor, the large current flow is from emitter to collector which is the reverse direction of the NPN transistor. Also, the base current flow is out of the “N” semiconductor which is also in the opposite direction compared to the NPN transistor as shown in the diagram below. To switch the transistor on, the base voltage has to be 0.7 volts less than the emitter voltage. A PNP transistor used in the 5 Series starter relay that is described elsewhere in this document as a switch to prevent engaging the starter motor when the engine is running. In summary, a small “control” current applied to the center semiconductor via the base connection allows a large current flow from the collector to the emitter for an NPN transistor, or from emitter to base for an PNP transistor, to flow through the transistor. Here are some good descriptions of how semiconductors work, how transistors work and how they are used as an electrical switch. Switches are mechanical devices that place a piece of metal between two terminals completing an electrical path between the terminals so current can flow from the (+) to the (-) battery terminals. Some mechanical switches stay in the position you move them until you move them the other way (rocker switch, rotary switch). Others only stay in position while you push them and then return to their original position when you stop pushing them (push button switch). There are also mechanical switches that work without you doing anything. These are switches that are able to move based on the pressure in a chamber in the switch to push on a metal plate that moves to bridge two terminals completing the electrical path between the terminals. There is a small spring behind the plate so when the pressure drops low enough, the spring pushes the plate away from the terminals opening the circuit. Here is a short movie of how the oil pressure switch is constructed showing how it works. This switch is from a 1983 R100RS but its internal construction and how it works is the same as the 5 Series switch. The 5 Series switch has a tapered pipe thread while the R100RS has a machine thread that requires a compression washer to seal it. Consequently, these switches can NOT be interchanged. Switches can be normally open (NO), which is the most common, or normally closed (NC). These terms describe if the switch contacts are not connected (NO) or are connected (NC) before the switch is actuated. Relays are electrically operated switches. Consequently they usually have four terminals: two that carry current to activate the switching action (called the “drive” terminal in the DIN standards, or “contact” terminals), and two that carry the current flow that needs to be turned on and off, commonly called the switched terminals. Some relays can have more than four terminals. Relays use coils to create a magnetic field when current from the contact terminals flows through the coil. This field attracts a metal contact that moves to bridge the two switched terminals that carry the current flow that is being turned on or off. 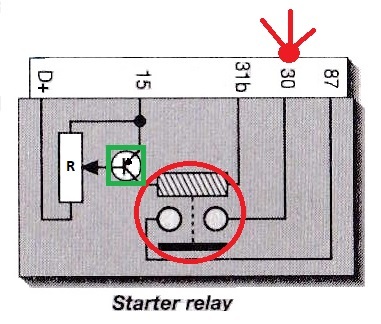 This design is suggested by the schematic symbol for the stater relay as shown below. Inside the Red Circle, you can see the symbolic representation of a horizontal coil of wire attached to the two contact terminals (15) and (31b). The dotted line to the horizontal solid black bar represents the movable metal contact that is pulled up when the coil is magnetized to connect the switched terminals (30) and (87). Terminal (30) carries current directly from the (+) terminal of the battery which then flows out of the starter relay on terminal (87) which is connected to the starter solenoid. 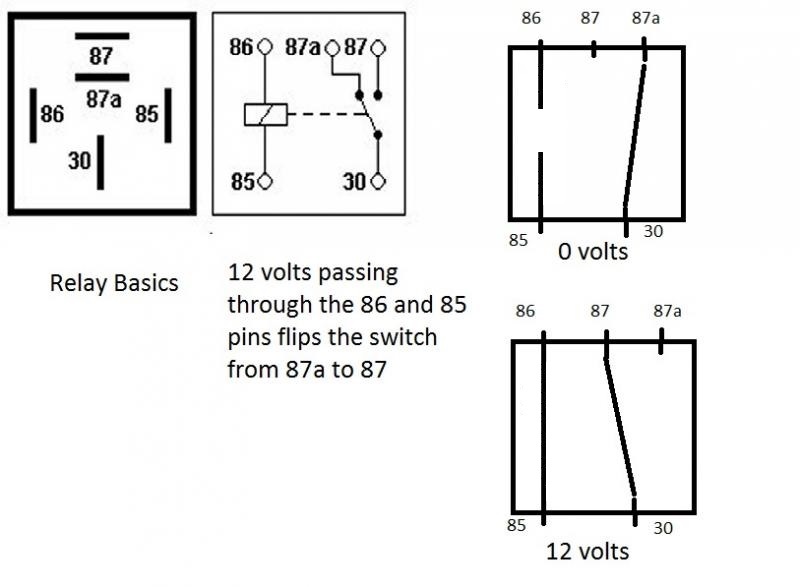 – If there is a terminal (30), it’s the input of the switched terminals and (87) is the output. – If there is a terminal (88), then (87) is the input of the switched terminals and (88) is the output. That’s an example of how standards are “bent” to accommodate reasonable variations in practice. The starter solenoid documented elsewhere in this document is another relay with some special operating characteristics as well as being designed to handle the very high current flow that goes to the starter motor. Relays can have terminals that are NO or NC. The DIN standard specifies the terminal number for a NO output terminal as (87) if the input side is (30), while the terminal number for a NC output terminal as (87a). In some relays, when the current is not flowing through the contact terminals, switched current flows from terminal (30) to terminal (87a). When current flows through the contact terminals (85) and (86), terminal (87a) opens stopping the switched current entering from terminal (30) from flowing though terminal (87a) and switches the current entering from terminal (30) to flow out of terminal (87). 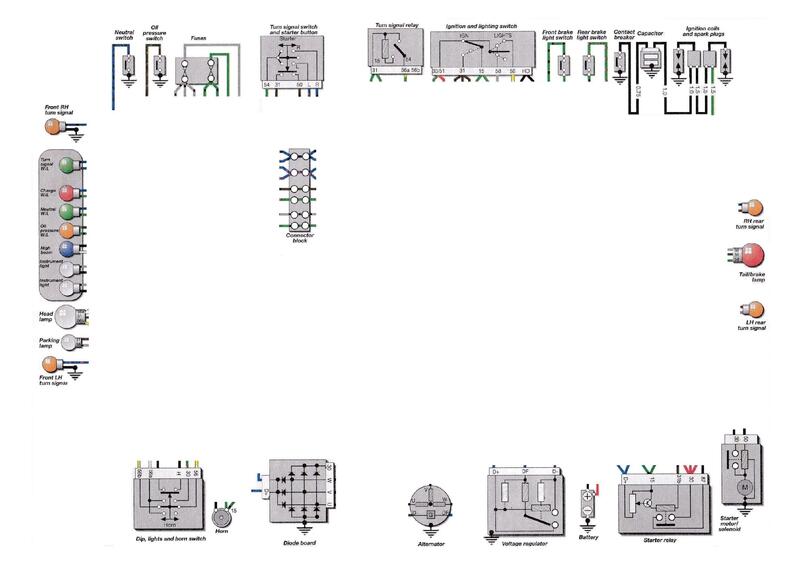 This is suggested by the schematic of such a relay shown in the image in the middle of the top row. The terminal configuration on the bottom of the relay is shown in the image on the left of the top row. The other two images on the right, top and bottom, show how switched connections are oriented when there is no power (0 volts) or when power (12 volts) is applied to the contact terminals. The 5 Series only uses relays that are NO and does not use any with both terminal (87) and (87a). There is a special kind of relay with only switched terminals and no contact terminals. It uses a bi-metal conductor to bridge the switched contacts. The bi-metal conductor is made of two strips of different metals. When current flows through the switched contacts the bi-metal conductor heats up. Metals expand when heated, but different metals expand at different rates when heated the same amount. So one of the bi-metal pieces expands more than the other so the bi-metal conductor bends. Eventually, the curvature of the bi-metal conductor is large enough that it no longer bridges the switched contacts and the current flow through the switched contacts stops. This stops current flow through the bi-metal conductor letting it cool, unbend enough to again bridge the two switched contacts again and the cycle repeats. This type of relay oscillates at a steady rate between on and off. That’s exactly what you want for turn signals that need to blink. 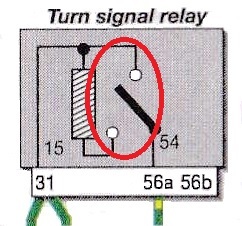 The 5 Series uses this type of relay for the turn signal relay. The design of the 5 series turn signal relay depends on the total resistance of the turn signal circuit including the bulb filaments and resistance of the connectors. If one filament burns out, the blink rate changes. If corrosion increases the resistance of connectors the blink rate changes. This is a special type of relay with only two switched terminals that uses the coil’s magnetic field to vibrate a thin piece of metal. The relay is NC with the metal plate touching the two switched terminals. Each terminal connects to one side of the coil. When a current flows through the terminals, it goes through the metal plate into coil whose magnetic field then pulls the plate until it moves away from the terminals. That cuts the current through the coil so the magnetic field collapses. There is a spring pushing against the plate that snaps it back to touch the terminals, and the cycle repeats. By designing the thin metal plate carefully and adjusting the spring tension, the metal plate can be made to oscillate at a specific frequency. This is how the 5 Series horn works using a mechanical flapper relay to create a specific tone. 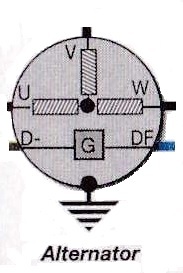 The following components contain relays which are indicated by the red circle. You probably noticed that the contact terminals of the starter relay have different numbers than the DIN Terminal Code Standards of (85) and (86). If you look at the DIN standard for terminals, you will see that (31b) is negative, or ground from a switch or relay. So, it’s a better description of the wire that connects to this contact as it comes from the starter button which is a push button switch that creates a path to ground. The power into the relay contacts comes from the ignition switch after the fuse, so labeling it (15) is more specific as to the source of the input current to the contacts. Once again, there is some interpretation allowed when applying the DIN terminal standards. It’s a container to store electric charge. Inside, chemical reactions take place that create a surplus of electrons on one terminal (the negative) and a deficit of electrons on the other (the positive) when the battery discharges. A battery has to be “charged” with electricity before it will work. It stores electrical charge put into it from a source of electricity, such as an alternator, using another series of chemical reactions that store electricity as potential energy in the bonds of chemical compounds. For the electric charge stored in a battery to flow out of it, a conducting path between the (-) terminal and the (+) terminal has to exist. Metal wire is commonly used to create this path, but any conducting material connected between the terminals will start the chemical reaction that releases the electrons stored in the chemical compounds. Historically, and incorrectly, it was assumed electricity flowed from the (+) to (-) terminals of a battery. This direction of electric current flow is called “conventional currrent flow”. Later, electrons were discovered, and it was shown they are what moves when an electric current flows in a wire, so the actual direction of “electron flow” is from (-) to (+). This makes describing how a battery works confusing. I use electron flow [from (-) to (+)] when I discuss the chemical reactions, and I use conventional current flow [(+) to (-)]when I describe using a battery in a dc circuit. When the (-) and (+) terminals are connected together, a “discharging” chemical reaction occurs at the terminals inside the battery so electrons can flow from the (-) to (+) terminal. For a lead-acid battery that’s commonly used in a motorcycle, the discharging reactions involve lead, lead-oxide and sulfuric acid. Lead is used for the (-) terminal and lead-oxide is used for the (+) terminal. The sulfuric acid reacts with the lead and lead oxide producing electrons, hydrogen, oxygen and sulfate ions. The sulfate ions combine with the lead and lead oxide changing them into lead sulfate. The hydrogen and oxygen ions combine into water. These reactions only occur when there is a conducting path between the (+) and (-) battery terminals. If you take a short piece of wire and attach it between the (+) and (-) terminals of a 12 volt battery, a tremendous amount of current flows through the wire as there is almost no resistance in the piece of wire. The wire will melt and may explode. For this reason NEVER let anything that conducts electricity, such as a wrench, screwdriver, etc., touch the battery terminals. Eventually the reactions at each terminal stop due to lack of lead at the (-) terminal and lead oxide at the (+) and the battery becomes “discharged”. When current flows into a battery during charging, the “charging” chemical reactions occur. The lead sulfate at the (-) terminal changes back into lead and the lead sulfate at the (+) terminals changes back into lead oxide. The water changes into hydrogen and oxygen ions. The sulfate ions combine with hydrogen ions to become sulfuric acid while the oxygen ions combine with the lead at the (+) terminal to become lead oxide. The charging chemical reactions can create hydrogen gas which is very explosive if it is confined with air. Usually this gas is vented for an open cell battery, or contained inside the case for a closed cell battery. Overcharging a battery can cause an explosion from the excess hydrogen gas produced. A 5 series lead-acid battery can provide a maximum voltage of about 12.6 volts when it is discharging. It is made from six battery cells connected in series. Each cell produces about 2.2 volts, so six in series deliver about 12.6 volts. Charging a battery requires the voltage applied between the (+) and (-) terminals to be greater than the internal 12.6 volts created by the discharge reactions of the battery so the charging reactions can occur. Typical charging voltage for a lead-acid battery is about 14.1- 14.4 volts which is enough to overcome the internal voltage of 12.6 volts allowing electrons to flow into the battery and initiate the charging chemical reactions. If the charging voltage is too high, the battery can be damaged and/or explode. The charging system is responsible for charging the battery. It includes a 3-phase ac alternator, a diode board, also known as a rectifier, and the voltage regulator. The battery is also part of the charging system since it is the recipient of the output from the diode board. Refer to the Charging Circuit section of the 5 Series Circuits document to see how these components are connected. It is a device that creates alternating current (ac) electricity by spinning a coil of wire inside a stationary magnetic field, or by spinning a coil’s magnetic field inside a stationary coil of wire, which is how the BMW motorcycle alternator works. On the 5 Series, the alternator is used to charge the battery, but not to power lights and other electrical equipment on the motorcycle. They receive power from the battery. Below is an exploded view of the alternator components. The 5 Series alternator generates 3-phase alternating current. This requires three coils to be wound on the stator. 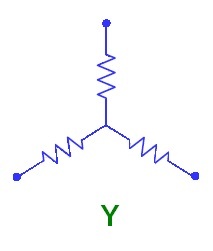 The stator wires are arranged in what is called the “Y” configuration as shown below. Each phase is one leg of the “Y”. Note that one end of each coil is connected together at the junction of the three branches. This common connection is called the “center tap” or “neutral” connection. The “Y” nomenclature invokes the notion that each phase is 120 out of phase with it’s neighbor. The other end of each coil exits the alternator via a terminal on the front cover. The three phases are referred to as “U”, “V”, and “W” which is denoted on the Haynes Manual wiring diagram symbol for the alternator. 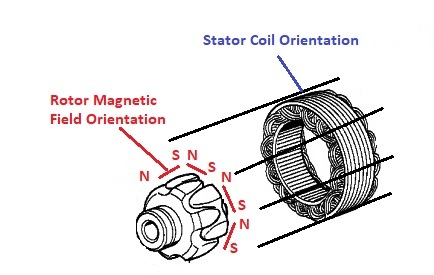 In the BMW alternator, the magnetic field movement is created by the rotation of a “rotor” coil with current flowing through it that is connected to the crankshaft and spins inside the “stator”. Electrons flow through the rotor coil to create a magnetic field. As the rotor spins, the rotating magnetic field cuts across the three coils of wires in the stator inducing electron flow in the stator coils. Since the coils are arranged so they are 120 degrees apart around the perimeter of the stator, the stator produces 3-phase ac current. The rotor has two brushes that supply current to its coil; the (DF) brush is the input from voltage regulator and the (D-) brush is grounded to the cover of the alternator creating a complete path back to the (-) battery terminal. The (D-) terminal also has a terminal with a BROWN wire that goes back to the (D-) terminal of the voltage regulator. When a magnetic field cuts across a coil of wire at right angles the magnetic flux causes electrons in the coil to move in a direction defined by the direction the field. If the magnetic field is reversed the induced current in the coil goes in the opposite direction. If the polarity of a magnetic field repeatedly changes, the current flow in a coil also changes creating an alternating current in the coil. 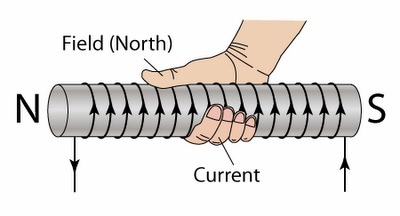 If you wind a coil around a rod and send current through it, the magnetic field has a north pole at one end of the rod and the south at the other. The magnetic field’s flux lines are parallel to the rod and the right hand rule tells you where the north pole is as shown in the diagram below. The difference between magnetic field and magnetic flux is subtle. The magnetic field is assumed to start at the north pole and continue in a continuous path to the south pole. The field extends through out space so it exists in air, a vacuum and in metal. Magnetic flux is a measure of the density of the field crossing an area at right angles to the field. Some materials, such as iron or steel, concentrate the magnetic field lines so the flux is higher than it is in air. A coil concentrates the magnetic field lines in the interior space of the coil, so wrapping a coil on a steel rod increases the magnetic flux in the interior space of the coil. It is parallel to the axis of the rotor and the axis of the stator coil wires. So very little current will be generated in the stator coil since induced current is zero in a wire that is parallel to the direction of the magnetic field. 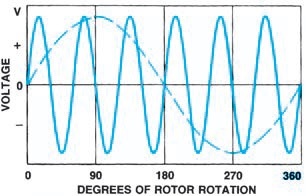 Only the ends of the coil that turn back 180 degrees are at right angles to the rotor’s magnetic field. This is illustrated below. The magnetic field is weak on the outside of the rotor but very strong inside due to the steel shaft in the center of the rotor coil. This reduces the amount of induced current in the stator coils since a low magnetic flux exists on the outside of the rotor coil. These problems are solved with metal “fingers” attached to the metal core of the coil that are wrapped around the edge of the rotor then extend along the outside of the coil as shown below. The fingers attached to one end are the north pole of the magnetic field while the fingers attached to the opposite end are the south pole of the magnetic field. This solves the two problems with the rotor coil making a strong magnetic field on the outside of the coil that is at right angles to the axis of the stator coil wires as shown below. The finger design has six pairs of north-south magnetic poles so there are 12 changes in the magnetic field per revolution and in turn that induces 12 changes in the direction the electrons flow in the three stator coils per rotor revolution. If the rotor coil magnetic field reversed once while rotating inside the stator and the stator is wound with three separate coils offset at 120 degrees from each other, the current flow in each stator coil will go in one direction, stop, and then flow in the opposite direction once per revolution creating an ac current and voltage in each stator coil that looks similar to the diagram below. 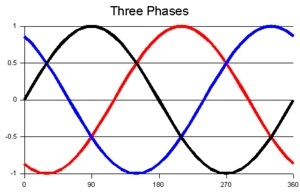 Each color represents one phase of the stator output. 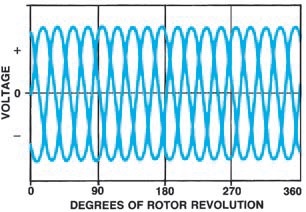 But, there are 6 pairs of N-S poles on the rotor, so instead of one cycle of ac current produced per rotor revolution in a phase, six complete cycles are produced per revolution as shown below. Since the stator has three coils, the alternator output going to the diode board looks like the diagram below with each phase creating 6 cycles of ac current flow per rotor revolution. This link below is one of the best descriptions of the how a 3-phase automotive alternator, like the one used in the 5 Series, is constructed and how it works. The 5 Series does not use the “center tap” output to the diode board. This design provides more power and is used for the 6 Series and later alternators. Since the battery produces dc current, the battery can’t charge if ac current is applied to it. 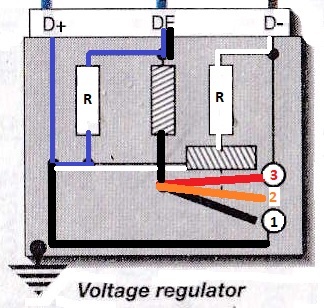 When the ac current flow reverses directions and the voltage goes from (+) to (-), an ac (+) will connect to the battery (-) (and vice versa) so a short circuit occurs. Not a good thing. So, the ac has to be converted into dc before reaching the battery. This is the job of the diode board. The diode board is configured with nine diodes. Six of them create a full wave rectifier to convert the ac current from the alternator into dc current that charges the battery as shown below. On the top left are the three connections from the stator coil terminals, “U”, “V” and “W”, to the corresponding input terminals of the diode board on the top right. The full wave rectifier inverts the negative part of the 3-phase ac current flow, bottom left, so it is positive, bottom right. The output from the diode board on terminal (30) looks like the series of hills on the bottom right of the diagram and this is what goes to the battery (+) terminal to charge the battery. The (-) side of the diode board is connected to the (-) battery terminal through the metal bolts that attach the diode board to the engine block. Due to the proximity of the diode board edges to the front engine cover and the fact the bottom of the diode board metal chassis is directly connected to the (+) battery terminal via terminal (30), it is possible for the front engine cover to create a short circuit with the bottom of the diode board metal chassis. This will short out one of more diodes on the board. ALWAYS REMOVE THE BATTERY GROUND FROM THE TRANSMISSION SPEEDOMETER BOLT BEFORE REMOVING THE FRONT ENGINE COVER. 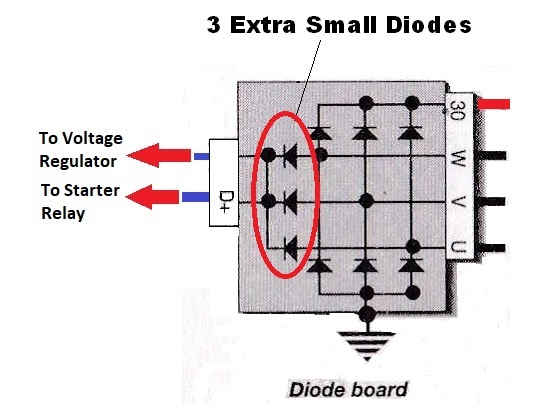 The diode board contains three additional small diodes, as shown below, that supply dc current to the diode board (D+) terminal, The diode board (D+) terminal is connected to the voltage regulator and to the starter relay. The voltage regulator senses the alternator output voltage and can adjust the current flow through the alternator rotor coil to prevent the charging output from exceeding about 14.1 volts so the battery is not damaged. The starter relay senses the output from the alternator to lock out the starter relay so the starter motor and solenoid can’t engage when the engine is running. The voltage regulator limits the charging voltage to the battery to prevent damage to the battery. The current flow and voltage from the alternator will continue to increase as the engine RPM increases. The maximum charging voltage for lead-acid batteries is about 14.1 volts, so there has to be a means to limit the alternator output. The voltage regulator senses the alternator output using the dc voltage from diode board (D+) terminal which is supplied by the extra three small diodes on the diode board. The voltage regulator limits the current flow through the alternator rotor coil to limit the maximum voltage of the stator 3-phase output coils. Internally, the voltage regulator has two resistors, one coil and a relay. There are multiple parallel paths inside the voltage regulator. The relay arm can change when some of the paths are used as shown in the diagram below. The position of the relay arm modulates the amount of current flowing through the alternator rotor coil which increases and decreases its magnetic field. This varies the alternator output voltage. If the battery is discharged, the alternator voltage will rise and when the battery is fully charged the alternator voltage drops to almost zero. When the engine is off, the current flow from the battery is along the BLUE path to terminal (DF) and the WHITE path through the relay coil. The position of the relay coil contact arm determines which of the other paths, (1), (2) or (3) become available.. When the battery is almost charged, more current will flow along the WHITE path through the relay coil and it will move the contact arm to position (2) so it touches neither contact (1) or (3). This shuts off the BLACK path leaving only the higher resistance BLUE path reducing the current flow through the alternator rotor coil and reducing alternator output. When the battery is full charged the current flow will increase along the WHITE path through the relay coil enough to increase the relay coil magnetic field so it is strong enough to move the contact arm to position (3) which shorts out the (DF) path to the alternator rotor coil. This stops the current flow through the alternator rotor coil, but not instantly. The simplified diagram below shows the path of current flow from the battery to the voltage regulator and to the (DF) brush of the alternator rotor coil when the engine is not running. I left out the starter relay that would be connected to the BLUE wire between the charge indicator bulb and the diode board for simplicity. Terminal (D+) on the starter relay has a second wire that goes to the (D+) terminal of the diode board so for this discussion, we don’t need to consider the starter relay. When the engine is off, the voltage regulator lets current flow from the charge indicator bulb (circle with an “X” inside it) in the headlight shell from the (D+) terminal of the diode board which is a common connection with the BLUE wire going to the (D+) terminal of the voltage regulator. The current coming into the (D+) terminal from the charge indicator bulb can not flow into the diode board since the three small diodes prevent current flow from that direction. The charge indicator bulb current passes through the voltage regulator along the path marked in BLUE to exit the (DF) terminal on the BLUE-Black wire to the (DF) brush of the alternator rotor coil windings and then to ground via the (D-) terminal that is connected to the metal alternator housing that is bolted to the engine block. This current flow from the charge indicator bulb creates a small magnetic field in the rotor coil when the engine is not turning. This “boot strap” magnetic field allows the alternator to generate power when the engine starts turning over after the starter motor engages. If there is any break in the path from the charge indicator bulb to the ground at the alternator (D-) terminal, then this is an open circuit and the alternator can not generate any power even after the bike is running. If the charge indicator bulb does not light when the ignition is turned on, the alternator is not working and the battery will not charge. This is your first warning that there is a problem in the charging indicator bulb circuit. A common cause is a broken or shorted winding in the alternator rotor coil. After the engine starts, the alternator delivers ac current to the diode board which delivers dc current to both terminal (30) to charge the battery, and to its (D+) terminal. At idle, this current is greater than what flows out of the charge indicator bulb and the direction of current flow from the (D+) terminal is opposite to the current flow coming out of the charge indicator bulb as indicated by the large BLUE arrow pointing at the charge indicator bulb. The result is the voltage difference across the charge indicator bulb goes to zero and the bulb goes out. If the charge indicator bulb does not go out after the engine starts, the alternator, voltage regulator or diode board have a failure preventing dc current from flowing back to the charge indicator bulb. If the battery voltage is a bit low, which is typically the case after the starter motor starts the engine, the relay in the voltage regulator connects to the lower contact due to the spring pushing it down and since a lot of the alternator current is going to charge the battery so there is not enough current flow through the relay coil to move the relay arm against the spring. In this position, the coil connected to terminal (DF) is a very low resistance path through the voltage regulator so the current flow to the rotor coil is high ensuring maximum voltage output from the alternator to charge the battery through diode board terminal (30). Eventually the alternator voltage increases enough to be near the maximum charging voltage of about 14.1 volts. At this point the current flow through the relay in the voltage regulator has also increased and becomes strong enough to move the arm off the lower contact, but it is not strong enough to pull it all the way to the upper contact against the force of the spring. This reduces the current flow to the rotor coil since it can only flow through the left resistor reducing the current flow to the alternator rotor coil. Eventually when engine RPM increases and the battery is fully charged, the alternator voltage output reaches the cutoff voltage and the current flow through the relay increases enough that its magnetic field moves the relay contact arm all the way to the upper contact against the force of the spring as shown in the diagram below. With the relay arm in this position, the current flow to the alternator rotor coil is grounded through the (D-) terminal of the voltage regulator which is connected to the grounded (D-) terminal on the alternator housing. Therefore the alternator output from the (D+) terminal is shorted cutting off the current flow through the alternator rotor coil. But due to the behavior of an ignition coil when it’s magnetic field collapses, it takes some time for the alternator rotor coil current flow to stop completely. As the current flow through the alternator rotor coil drops, the output voltage from the alternator stator coils drop reducing current flow to the battery via diode board terminal (30) and to the voltage regulator via terminal (D+). This rapid reduction in current flow is suggested by the small BLUE arrow along the BLUE-Black wire from the voltage regulator (DF) terminal to the rotor (DF) brush and the small BLACK arrow from the alternator stator coils to the diode board. Of course, when the output voltage from the alternator falls suddenly, the current flow through the relay coil falls and the spring pushes the relay arm down. The arm may go to position (2) or if the RPM drops back to idle, it may go all the way to position (1). This boosts the current flow through the rotor coil which again increases until the alternator voltage rises to the cutoff value and this cycle repeats. The duration of the reduced output from the alternator and the (D+) terminal of the diode board is not long enough to light the charge indicator bulb filament. It takes longer to heat the filament to incandescence than the duration of the reduced current flow from the alternator before it jumps back up again. The design of the voltage regulator causes the relay to oscillate between high current flow to the rotor (arm at bottom contact), lower current flow to the rotor (arm in between contacts) and almost no current flow to the rotor (arm at top contact). The modulated output of the alternator depends on how long the relay arm stays in any of these three positions. At very low RPM, the arm will spend a lot of time connected to the bottom contact. At 3500 RPM or more with a fully charged battery, the arm will spend a lot of time connected to the top contact. The starter relay, starter motor and solenoid are part of the starter circuit which is described in the 5 Series Circuits document, Starter Motor section. This circuit includes the battery, the starter button, the starter relay, and the starter motor and solenoid. This circuit uses one manual switch, the starter button, and two relays, the starter relay and the starter motor solenoid to connect power from the battery to the starter motor. The starter relay is designed to prevent activating the starter motor when the engine is running. The starter relay interlock feature protects the starter motor and flywheel from damage. If the charge indicator light is on while the engine is idling, the starter relay protection is not going to work. It’s important to adjust the idle to ensure the charge indicator light is off when the motor is running. and it has a relay (Red Circle) that sends power to the starter motor solenoid which is also a relay and is the one that actually applies direct battery power to the starter motor. Since starter relay terminal (30) provides a common connection for several wires that go directly to the (+) battery terminal, if any of these wires are loose, or the terminals are corroded the entire electrical system can shut down. It’s a good idea to remove the female connectors on terminal (30) and clean them along with the male spades periodically. Current is sent to terminal (15) when the ignition switch is turned on. The transistor inside the Green Box is a PNP type. If you don’t understand how transistors work, please click the link above to read the Transistor section in this document. For current to flow through the transistor’s emitter (the top connection) and out the collector (the bottom connection) and then through the relay coil to energize it, there has to be a small current flow out of the transistor’s base (the left connection). When this current flow is large enough, the transistor turns “on”, meaning current can flow from the emitter to the collector. For the transistor to turn on, voltage difference between the base and the emitter has be about 0.7 volts lower that the voltage at the emitter. The variable resistor is adjusted at the factory so the center tap (wire from the center of the resistor to the base) reduces the battery voltage on that wire so it is 0.7 volts lower than the voltage at the emitter. A variable resistor is like two resistors in series with the value of each adjustable to apportion a fraction of the total resistance to each. 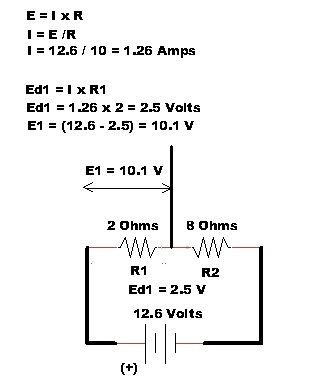 As shown in the diagram below, the variable resistor has a total resistance of 10 Ohms and has been adjusted so the first resistance is 2 Ohms and the second 8 Ohms. Using Ohm’s law, the current flowing through the variable resistor is about 1.26 amps. We can now calculate the voltage drop (Ed1) across the first resistor. It is about 2.5 volts. Therefore, if you measure the voltage between the center lead of the variable transistor and the (+) battery terminal you will get (12.6 – 2.5) or about 10.1 volts. Therefore, a variable resistor can be used to divide a total across the variable resistor into two parts. For this reason it is sometimes referred to as a “voltage divider”. Inside the voltage regulator, the variable resistor is adjusted so the voltage drop across the first resistor is about 11.9 volts which is about 0.7 volts less than the 12.6 volts that would normally be found at the emitter from a fully charged battery. 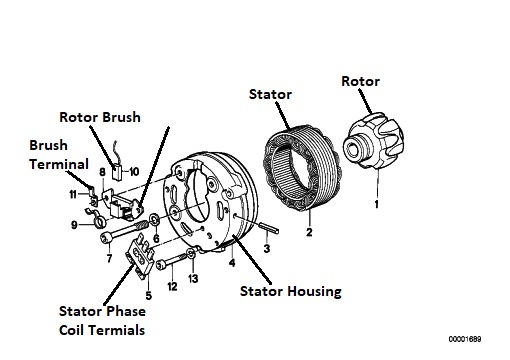 It exits the voltage regulator on a BLUE-Black wire via the (DF) terminal and connects to the alternator rotor (DF) brush terminal, goes through the rotor coil and then to ground as shown toward the bottom of the partial 5 Series wiring diagram below. Therefore, the (D+) terminal of the voltage regulator is the path to ground for the current flowing through the variable resistor. If the charge indicator light is not lit when the ignition switch is turned on, then the path to ground from the (D+) terminal of the starter relay is open. The starter relay will not work since there is no current flow from the transistor base to turn the transistor on so not current is allowed to flow though the relay coil to pull in the relay arm across the switched contacts. When the starter button is pressed, it creates a path to the (-) battery terminal through terminal (31b) of the starter relay. Since the transistor is on, it allows the current from terminal (15) to flow through the relay coil activating it and pulling in the relay arm. This completes the circuit from terminal (30) to terminal (87). Current flow from terminal (87) goes to the starter motor solenoid. When the starter motor spins and the engine starts running, the alternator starts working and produces ac current flow to the diode board which changes it into dc current to charge the battery from terminal (30) and also send dc current to the (D+) terminal. That terminal is connected with a BLUE wire to the (D+) terminal of the starter relay. As shown previously, the starter relay (D+) terminal is part of the ground path for the current flowing out of the transistor base to the (-) battery terminal. But, now there is positive current flowing into the (D+) terminal of the starter relay terminal that opposes the current trying to flow out. This result is a reduction of the voltage drop across the variable resistor so the voltage drop between the base and the emitter is less stopping current flow out of the base. That shuts off the transistor stopping the current flow from terminal (15) through the emitter to the collector and through the starter relay coil. This means the starter relay can’t work when the engine is running. The interlock feature provided by the transistor protects the flywheel and starter motor. Should you accidentally push the starter button while the engine is running: the starter motor won’t engage with the flywheel. If it did, you would likely break teeth off the flywheel and damage the starter motor. If the charge indicator bulb is on when the engine is idling, then there is insufficent current flow from the diode board (D+) terminal to shut of the bulb and likely, the transistor base voltage is low enough for the transistor to still be turned on. If you hit the starter button in this situation, it will try to engage the flywheel. NOT GOOD. Some folks like to try set the idle RPM as low as they can which will let the charge indicator bulb light. THIS IS NOT A GOOD IDEA. When it is very cold, even good batteries can’t maintain their fully charged voltage when the large power draw of the starter motor has to be supplied. When the battery discharges the discharge chemical reaction starts to supply current to an electrical load such as the starter motor. The discharge chemical reaction has to occur fast enough to meet the current draw of the load, or the battery voltage will drop. When its very cold, the the chemical reaction rate is slower so the battery can’t supply as much instantaneous current flow as it can when its warmer. The effect of this is that when you turn on the ignition, you see the charge indicator bulb light. You hit the stater button and you hear the click of the starter relay closing and you may even hear the starter solenoid click and the starter motor gear start to engage the flywheel. Then the starter motor gear disengages and you hear a Click – Click – Click of the starter relay closing and opening repeatedly but the starter motor doesn’t work. You may conclude you have a bad battery, but that may not be the case. 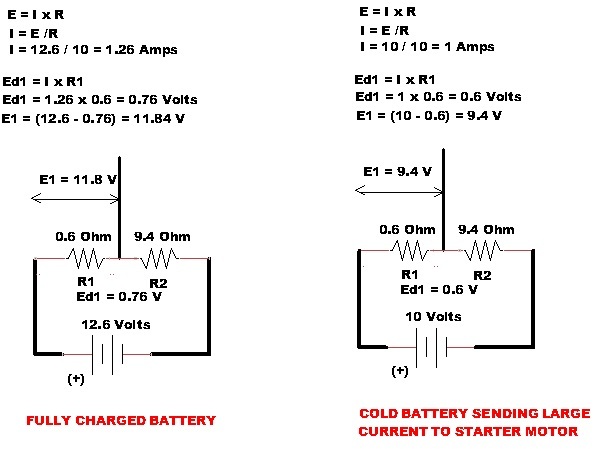 The lack of reserve battery power when its too cold causes the transistor base current to get too low when the large current flow suddenly goes to the starter motor and that turns the transistor off. When that happens it cuts the large current flow to the motor, the battery voltage quickly rises and that increases the current flow from the base of the transistor enough to close the starter relay causing the solenoid to power up. Once again the high current flow to the starter motor drops the current flow out of the transistor’s base and the cycle repeats. The value of the variable resistor in the example below is made up. I don’t know its value. But the example calculation is valid. On the left of the diagram below, the variable resistor is set to deliver 11.9 volts to the base of the transistor so the base voltage is about 0.76 volts lower than the emitter of the transistor turning it on. On the right is the condition right after the battery starts sending a high current flow to the starter motor. Due to the fact a very cold battery won’t supply as much current flow as a warm one, the battery voltage drops almost immediately to 10 volts. This reduces the voltage drop (Ed1) across the first resistor to about 0.6 volts which is too low to keep the transistor turned on. When the starter relay opens, the battery voltage quickly jumps back up to 12.6 volts since it no longer is trying to supply the large current flow to the starter motor and now you have the oscillation between these two states that results in the “Cricket” problem. One characteristic of the starter motor is when it’s very cold outside and the engine oil is very viscous, it pulls even more current from the battery than when its warm and the engine oil is less viscous, and this exacerbates the cricket problem. When the mechanical resistance of the engine is higher it slows how fast the motor can turn. The slower the starter motor turns, the more current it draws through the stationary motor coil causing the battery voltage to drop even lower. Bob Fleischer has an article in the Resources section explaining how to modify the starter relay to avoid this problem. When current flows from the starter relay terminal (87) it goes to starter solenoid terminal (50) as shown in the diagram below. 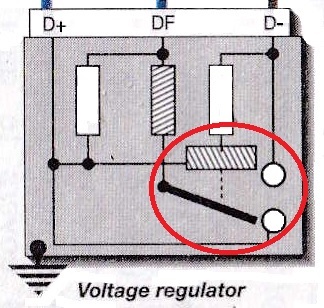 The solenoid, which is special type of relay, is shown inside the Red Circle. The solenoid is sized to handle a large current flow direct from the battery arriving on terminal (30) through the solenoid switched contacts to the starter motor. The starter solenoid has two coils of wire, a pull in coil and a stay in coil, as suggested by the black wire exiting the middle of the in the diagram above. The pull in coil requires more current to create a strong enough force to move a metal slug quickly against the internal switched contacts that connect terminal (30) to the starter motor and force the special Bendix gear to extend outward to engage the teeth on the edge of the flywheel. Once the slug inside the solenoid has been pushed onto the contacts that power the starter motor, and the Bendix gear has engaged the flywheel teeth, current flows directly from the battery to the starter motor. To avoid overheating the solenoid wires after the metal slug has bridged the starter motor power contacts, the pull in coil is disconnected but the stay in coil is still connected to keep the slug firmly against the starter motor switched contacts and the Bendix gear engaged with the flywheel teeth. Turning off the pull in coil also allows more current flow to the starter motor. The starter motor develops almost 1 Hp so it’s quite large. As it spins up, a special gear called the Bendix gear has been pushed down a shaft by the solenoid slug to engage with the teeth on the edge of the flywheel. This locks the starter motor to the flywheel so it can spin the engine. When the engine starts, it will turn faster than the starter motor which causes the special gear to spin backwards retracting it from the flywheel teeth. Here is a short video of testing the starter motor and solenoid where you can see how the special Bendix gear on the starter motor is pushed forward by the solenoid slug and the slug puts power to the motor. 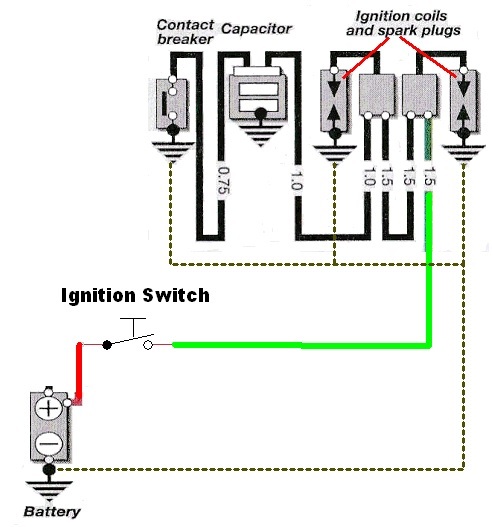 The ignition system implements what is known as a Kettering ignition system. The system includes a source of dc current flow, the battery, a special ignition coil that steps up the 12.6 volts of the battery in the primary windings to 20,000 or more volts in the secondary windings, an on-off switch (contact breaker or points) to turn current flow on and off through the coil primary windings, a capacitor (condenser) to suppress voltage arcing across the contacts of the points and to amplify the voltage in the secondary coil, and a spark plug threaded into the head at the top of the cylinder to generate a spark that ignites the fuel-air mixture in the cylinder at the right time. Here is a picture of the 5 Series engine ignition system. When the ignition switch is turned on, and the points are closed, battery power flows to the primary winding of the first of the two coils, exits via a black jumper wire to the primary of the second coil. It exits the second coil via a black wire that connects to one side of the condenser and also to a second wire on the same side of the condenser that goes to the points. Consequently, the current flowing from the output of the second coil flows directly to the points without charging the capacitor. The points have two contacts, one on a movable arm that rubs on a cam that opens and closes it, and the other fixed to the metal mounting plate that touches the engine block so current flows back to the (-) battery terminal via the engine block through the points to complete the circuit. As the current flows through the primary winding in the coil, it creates a magnetic field. This increasing magnetic field induces a voltage in the secondary coil winding as described in the Coil section elsewhere in this document. But the rate of increase of the magnetic field is not fast enough to cause the spark plug to fire. When the points open, the primary current stops flowing through the primary coil causing the primary coil magnetic field to collapse. This causes an oscillating current flow between the capacitor and the primary coil which is described in more detail in the capacitor section of this document. It induces a very high voltage in the secondary windings (20,000 – 30,000 volts) and prevents a spark across the open points contacts. This high voltage causes a spark across the electrodes of the spark plug that ignites the fuel-air mixture in the cylinder. If you look closely at the diagram above, you will notice that since the coils are in series, when the points open, both spark plugs fire. This design is called a wasted spark system because only one cylinder is at the compression part of the cycle while the other is at exhaust, so only the spark plug in the cylinder at compression will explode the fuel-air mixture and the other spark does not in the other cylinder. The way the condenser is connected, the points and the condenser are on parallel paths. When the points close that path becomes a short-circuit with very low resistance compared to the other path through the condenser. Consequently all the current flows through the points and not the condenser. When the points open, the short-circuit path through the points is open so no current can flow through the path to the points. This stops the current flowing through the primary winding of the coil causing its magnetic field to start collapsing. The collapsing magnetic field induces a large voltage in the secondary windings AND it also induces a flow of current out of the primary coil towards the capacitor. (See the Coil description elsewhere in this document). This backward current flow has enough voltage to cause a spark to jump across the points which can damage the contacts. But, the capacitor is now in the path from the primary coil to the open points and it has a much smaller resistance than the air gap across the points so all the backward current flow from the primary windings goes into the capacitor to charge it. This slows down the voltage rise in the primary winding so it doesn’t get high enough to cause an arc across the points. There is other important effect of the capacitor that greatly amplifies the voltage rise in the secondary windings as the primary field collapses. The current flow induced in the primary coil by the collapsing magnetic field interacts with the capacitor. As the backward current from the coil reaches the capacitor it stores the charge increasing the voltage of the capacitor. When it’s high enough, it causes a current to flow back toward the primary coil that causes its magnetic field to increase again. As the voltage of the capacitor drops, the collapsing primary coil magnetic field induced current once again is strong enough to flow toward the capacitor charging it up again. These change in the direction of current flow between the primary coil and the capacitor make the primary coil’s magnetic field oscillate very rapidly, much like it was attached to an ac current as shown in the diagram below. The effect on the secondary coil is to greatly increase the induced voltage since induced voltage in the secondary coil increases as the rate of change of the magnetic field increases. This ac-like oscillating primary coil magnetic field is rapidly changing in a short period of time, so it generates a larger inducted voltage in the secondary windings than that induced when the primary coil magnetic field is growing after the points close. You can read a simplified description of this effect in Robert Fleischer’s How Spark Plug Ignition Systems Work. A more detailed description of a “tuned LC circuit” can be found in LC Circuit: Wikipedia. The 5 Series uses two coils in series, each is responsible for firing one spark plug. Each coil is made of two independent coils, called the primary and secondary windings, one inside the other. The outer coil is the primary and is made of fewer coils of larger diameter wire connected to the 12.6 volts from the battery. The inner coil is the secondary with a much large number of turns of thinner wire. There is also a metal core inside the secondary windings to increase the strength of the magnetic field. The (+) side of the secondary connects to the (+) terminal of the primary. The (-) side of the secondary goes to a one electrode of the spark plug. The other electrode is welded to the base of the plug so it is grounded to the engine block completing the secondary circuit path to the (-) battery terminal. 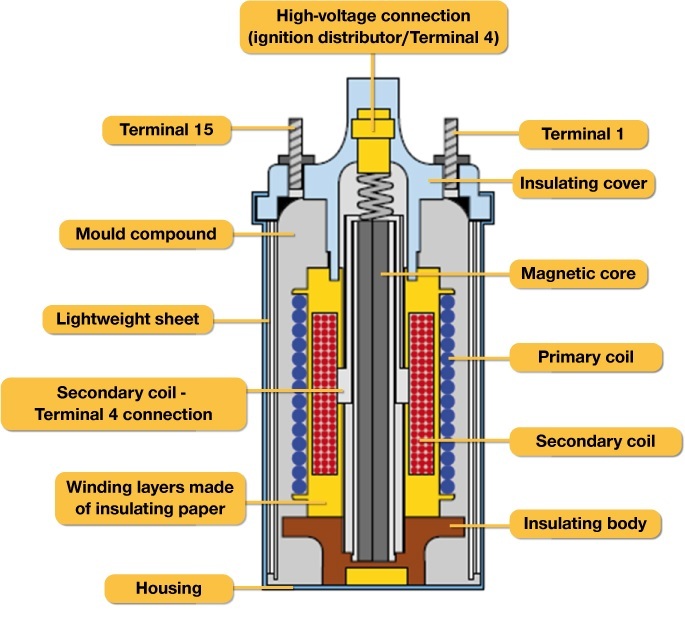 The diagram below shows a cross-section of a typical coil. When the ignition is turned on, if the points are closed, then current flows through the primary coil windings creating a magnetic field. This field moves past the windings of the secondary coil. It induces a current flow in the secondary until the magnetic field of the primary reaches full strength. The induced voltage rise in the secondary as the magnetic field grows is slow enough that the induced voltage in the secondary is too small to cause a spark across the spark plug electrodes. But, as explained in the capacitor section of this document, When the points contacts open, voltage induced in the secondary coil is much higher (20,000 or more volts) which is enough to create a spark across the electrodes of the spark plugs. 2019-01-22 Updated document series links. Minor edits.